After boiling and cooling milk keep it in the fridge for 24 hrs. Then remove cream.Keep cream in freezer so that it will not stink. Collect cream for a week. Take out, add starter(curd) and keep it at room temp. for 6-8 hrs depending upon the weather.It should not become sour. keep it in fridge for 2 hrs. Take a big bowl, add 1 tb.sp. water and transfer cream in this.Beat till butter is separated from curd.You can use hand mixer, elect. mixer or use a spoon and move in circular motion. Add a cup of water and beat with hand for some more time.Butter will come up. Take half cup cold water in a kadai.Take out butter in this.Leave the butter milk aside. Fold it nicely so that what ever curd is there will be separated from butter.Remove water. Place it on low flame stirring continuously. When you see brown at the side it is done. Let it cool for 20 min and strain with a metal strainer. Strain butter milk and use it for kadhi or just drink it. If you don t have cream you can use salted butter but it has different flavour. Hi! Divya . Gud Recipe . Thank U . Hello ! Lakshmi, thanx to U too for Ur Wonderful tip . when u accumulate cream daily,better to add a spoon of dahi in the container once in a week it helps cream not to stink when kept in the refrigerator.If churning of cream in not done after 6 to 8 days due to some work.cream remains in good condition. when making homemade ghee add a few cloves to the container, then cool and strain the ghee into a container. The ghee has a nice flavour and stays longer. 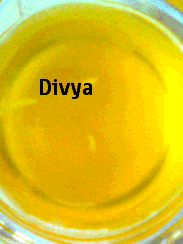 Hi Divya, Very useful recipe for those who love ghee like me. No matter how much oil u use some Indian dishes can't be made in the same manner with out ghee, ghee is their heart. Thanks.